Novena to St. Jude Thaddaeus: Article: God Cares! Even in our darkest hours...God Cares! Life has purpose. That, surely, lies at the heart of the Christian message. Yet Christians often feel they have drawn the short straw. That life has it in for them. Even that God has forsaken them in their blackest hour. As Christians, we recognize we are on a pilgrimage. But few - if any! - Christians escape the pilgrimage without pressing problems of one kind or another. Illness, often. Loss of income. Low pay and its consequences. Bereavement. Family pressures. Loneliness. The life of the Christian is not strewn with roses. And the occasional rose often has its thorns. As the apostle Paul wrote "If in this life only we have hope in Christ we are of all men most miserable" (I Corinthians 15:19)! But this is the life to which a loving Father has called us, and whatever the trial we can be assured that it has been filtered through His love. A godly reaction, on our part, to our trials ensures that we learn valuable lessons. Strength built during today's trial prepares for the next one! Just as with athletes, our spiritual muscles are built as we lift current spiritual burdens. And our mettle is hardened as we endure today's fiery trial. Sadly, many don't stick the pace. They opt out of God's training program for eternal life. It's not God's fault, for He assures us that "everything works for good with those who love him" (Rom. 8:28), and that "no temptation has overtaken you that is not common to man. God is faithful, and he will not let you be tested beyond your strength. but will with the temptation also provide a way of escape, that you may be able to endure it" (I Cor. 10:13). Note that. There's a way out - but it doesn't necessarily mean the burden is removed! What God does is provide ways and means to help us bear that burden. The path each of us treads is unique. What is child's play for you may be a faith-threatening challenge for me. But whatever the challenge, whatever spiritual battles we face, there is for each of us personal individual tuition. God has in His Word and through His Church, by His divine power "granted to us all things that pertain to life and godliness" (2 Pet 1:3f). The "means of grace" are there. First, God has through Jesus Christ placed within the assembly of His people every gift we need to conquer every foe, win victoriously every battle, overcome every challenge life throws at us. This is why it's vital for Christians to keep in close contact with one another - where possible by visiting and assembling with other brethren, and through letters or by phone. Only by contact with one another can we bear one another's burdens. Jesus Christ has placed in you gifts to serve the assembly! Even when "scattered" we can't afford to be an armchair Christian! Then there's God's manual for righteous living, His Word. Every life situation is catered for at least in principle. No matter how often we dig into the pages of our Bible there are new treasures to unearth about coping with the daily grind. Read, and study, it daily! Absorb God's prescription for "life with a capital L" as faithfully as you swallow the doctor's prescription! Next, every Christian is endowed with God's Holy Spirit - God dwelling in us. The Spirit prompts us to obedience and service. Heed what the Spirit says to you and to your church! Work out your salvation by expressing in your life all the divine "fruits of the Spirit" (Galatians 5:22f). Being filled with the Spirit is obedience to the Word of God. Prayer, now. Are we anxious, care-worn, worried? Paul tells us to "have no anxiety about anything, but in everything by prayer and supplication with thanksgiving let your requests be made known to God. And [as a result] the peace of God will keep your hearts and minds in Christ Jesus" (Phil. 4:6-7). The Psalmist adds: "Trust in him at all times, O people, pour out your heart before him; God is a refuge for us" (Ps. 62:8). And the apostle Peter writes, "Cast all your anxieties upon him, for he cares about you" (I Pet 5:7). Let us all, by faith, place our troubles, our concerns and anxieties upon the broad shoulders of our loving and merciful God, who in Jesus experienced the same kinds of trial that we undergo. "For we have not a high priest who is unable to sympathize with our weaknesses, but one who in every respect has been tempted as we are, yet without sin. Let us then with confidence draw near to the throne of grace, that we may receive mercy and find grace to help in times of need" (Hebrews 4:15-6). He's not afar off - but present with us through every situation. Moses wrote: "The eternal God is your dwelling place, and underneath are the everlasting arms" (Deut. 33:27). The God whose power created the heavens and the earth has also the power to see us through all those dark tunnels through which every Christian wanders. All our experience, if we react to it in a godly manner, is well worth it when we consider the hope that is set before us as heirs of God and fellow-heirs with Christ. Our present sufferings "are not worth comparing with the glory that is to be revealed in us" (Romans 8:18). In a sense, God, by creating man "subject to futility", places us at risk. All are subject to life's storms. to accident, to "time and chance". It is our response to life events that prepare Christians for a glorious eternity in the service of God. Let's use every "means of grace", every resource God provides, to achieve the full potential of that glory. 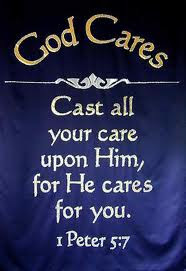 And let God take upon Himself our cares as He has promised!